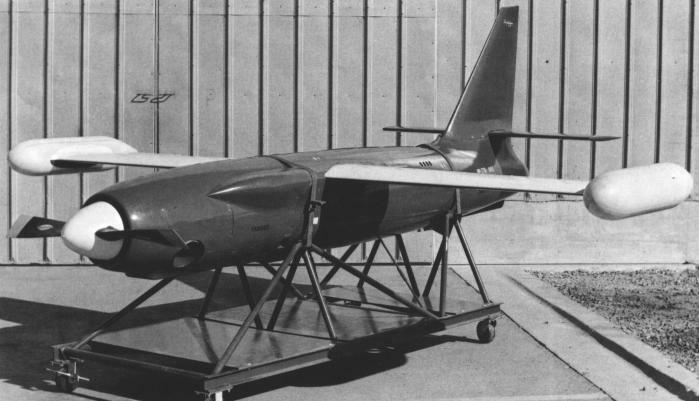 In 1955, Northrop's Radioplane division began the development of the RP-77 aerial target drone. The RP-77 was a propeller-driven aircraft with a general layout roughly similar to Radioplane's ubiquitous OQ-19 family. Two prototypes each of the RP-77 and RP-77A were built, the -77 with a four-cylinder McCulloch and the -77A with a six-cylinder Lycoming piston engine. The RP-77B and RP-77C with turbo-supercharged McCulloch and Lycoming engines, respectively, were never built. In May 1957, Radioplane made an unsolicited proposal to the U.S. Army for the RP-77D turboprop-powered version, and in June that year, the Army awarded a contract for 20 RP-77Ds for evaluation. The RP-77D first flew in March 1958. The RP-77D was powered by a Boeing Model 502-10F turboprop, and was zero-length launched with the help of four Loki rocket motors. The drone was radio-controlled from the ground, and could be tracked by radar for non-line-of-sight operations. At the end of the flight, it was recovered by a multi-stage parachute system. The RP-77D could be fitted with the usual aerial target equipment like radar and IR augmentation devices and scoring equipment. However, options for reconnaissance, meteorological and air-sampling payloads were also envisioned. It was even planned to build an RP-77D variant, which could act as the carrier aircraft for the smaller RP-76 rocket-powered target. Until December 1958, the Army conducted a total of 39 test flights of the RP-77D to evaluate the system and establish the aircraft's performance envelope. However, the test results did apparently not warrant a production run for the RP-77D. The planned RP-86 reconnaissance variant was also not built. During 1959, Radioplane implemented some improvements to the RP-77D (including a larger wing), which increased its performance, but this effort didn't raise any additional interest from the military.